Finance chiefs in the latest Duke/CFO Outlook Survey are refocusing on competitive issues. Does U.S. business believe that the economy is finally starting to turn the corner? The latest results from the quarterly Duke University/CFO Magazine Global Business Outlook Survey may provide at least a foundation for building on business confidence. After shooting above 60 last quarter, the U.S. Business Optimism Index in our third-quarter survey settled back to 58 on a scale from 0 to 100. This level of optimism remains encouraging, substantially higher than the floors in the low-to-mid-50s established at the end of last year and in the first quarter of this year. Finance chiefs’ outlooks for their own companies also started to edge upward again, hitting 65 out of 100 following last quarter’s rating of 64. Finance executives provided indications that that they are starting to think more about their competitors and less about their legislators. For example, in this quarter’s survey “price pressure from competitors” slipped above “federal government agenda/policies” on the list of external concerns for respondents. Bill Velasco, controller for the Engineered Products Division at Flowserve, a global supplier of industrial and heavy machinery, confirms that price competition is indeed heating up. But it’s still unclear who gets the credit (or the blame), according to Velasco. “We know the pressure is coming,” he says, “but I don’t know how much is being generated by activity in the market, and how much comes from customers asking us to be more efficient.” The company’s customers could very well be feeling their own pressure and passing that along, he notes. On the plus side, if the Fed does loosen its grip on interest rates, it’s not likely to be enough to prompt CFOs to change course with their near-term capital-spending plans. U.S. finance executives project their capital expenditures to rise by nearly 5% over the next year, keeping them in line with the trend established over the previous two quarters. Even if interest rates were to go up another 100 basis points by the end of the year, very few of the finance executives in the survey would reduce spending plans. It would take a 200 basis-point increase in rates to make a noticeable dent in spending plans at even 30% of companies. CFOs’ jitters have done little to dampen their outlook for earnings growth. Among the public firms in the survey, finance executives expect earnings to jump by an average of more than 13% in the next 12 months. Public-company revenues are also expected to grow faster than inflation, although at less than half the rate of earnings. Especially among the larger companies, public firms may be looking to wring that last bit of productivity from their workforces in order to support profitability. Although the survey-wide average for growth in full-time employment this quarter is 1.8%, during the next year companies with more than $500 million in annual revenue are barely looking to add full-time employees, if at all. Meanwhile, midsize and smaller firms expect to generate additional jobs at the rate of 4% or more over the next year. 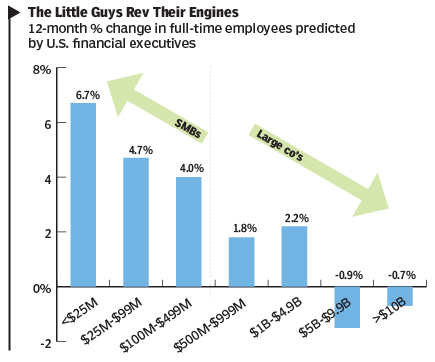 Among the privately held companies that form the backbone of small-to-midsize businesses, employment plans may well translate into higher revenues in the near term, as those firms reenergize their growth plans. Of course, small companies are keeping a close eye on the bottom line as well. At Eclipse, a family-owned business that makes industrial and process heating equipment, CFO Greg Bubp cites the same kinds of price pressures that are challenging Flowserve, and acknowledges the trade-offs firms like his are making. “You have to make a business decision as to what kind of margin you want to take that business at,” he says—and in some cases, be willing to walk away from it. Not surprisingly, the Great Recession has left its mark on employment strategies. Nearly six out of 10 respondents (58.5%) said their companies had increasingly sought out alternatives to full-time employees over the past few years, turning instead to temporary workers, part-time workers or consultants. Fueling this trend is economic uncertainty, cited by 44% of the respondents who indicated they had increased the proportion of work performed by other than full-time workers. However, nearly as many (38%) said that the new health care regulations under the Affordable Care Act had them thinking of shifting to resources other than permanent, full-time workers. Strictly fiscal concerns—specifically, the higher hourly wages commanded by full-time workers—came in a distant third. The outlook for domestic employment may also be affected as companies turn their sights overseas in the search for new growth. About 30% of respondents report that their companies already have payrolls to meet outside of the United States, and a plurality of these companies (35%) expect nondomestic hires will grow at a faster rate than domestic hires over the coming year. 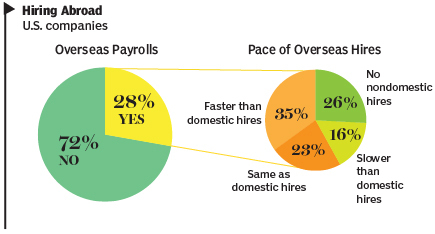 About another quarter (23%) say that nondomestic hires will be keeping pace with domestic hires. 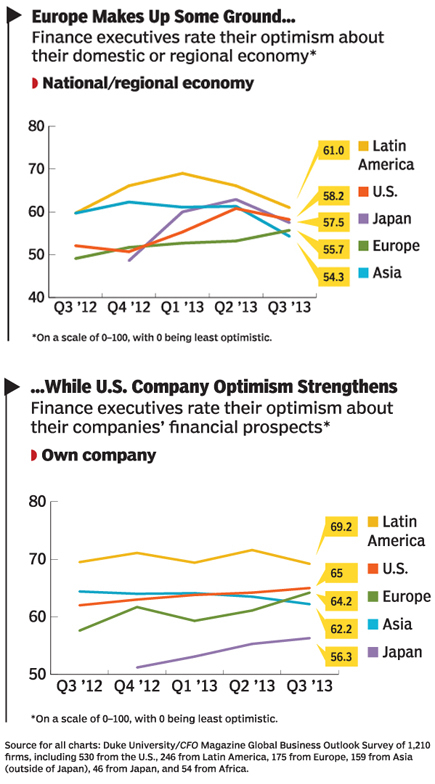 Outside the U.S., economic optimism seems to be balancing out to a degree. The outlook for Europe improved, while it tempered in both Asia and Latin America. In Europe, optimism about local economies (at 56 out of 100) and own-company optimism (64) both rose modestly over last quarter’s results. Expectations for revenue growth also ticked upward, to 3.6% for the next 12 months. Still, European companies aren’t out of the woods yet. The earnings outlook fell back a bit from last quarter, and the outlooks for both permanent and temporary workers continued to slide. At the same time, optimism in the Asian economies (outside of Japan) plunged, falling to 54 out of 100 from the previous quarter’s level of 62. And even fast-growing Latin America may be drifting back down to earth, as economic optimism moderated to 61 out of 100 (down from 66 last quarter and 69 two quarters ago). However, the outlook for earnings and revenue remain relatively strong in Latin America, at 9% and 8% annual growth, respectively. Wages and employment also continued to surge in the region.